Professional Hypnotherapy, NLP and Coaching in Harley Street, London. We offer our clients a wealth of experience gained over many years of practice using the most effective treatments available in the industry. Your emotional welfare is our number one priority. Welcome to Hypnotherapy Associates, where we provide hypnotherapy in London. We also provide NLP and coaching in London for a breadth of help from gaining more confidence to losing weight, reducing anxiety, increasing well-being plus much more. We, being the Hypnotherapists and Coaches in London, Bonita and her excellent associates. We are senior hypnotherapists and coaches, and Bonita established Hypnotherapy Associates over 10 years ago in London's Harley Street. We wanted to provide hypnotherapy and hypnosis that gives not only extraordinary outcomes for our clients, allowing them to live beyond their expectations, but also to provide a comfortable, safe and professional environment where our clients feel secure to fully explore and awaken inner resources that allow change to happen. We take our hypnotherapy very seriously, we bring you contemporary, evidence based Hypnotherapy, NLP and coaching that you can trust and have confidence in. 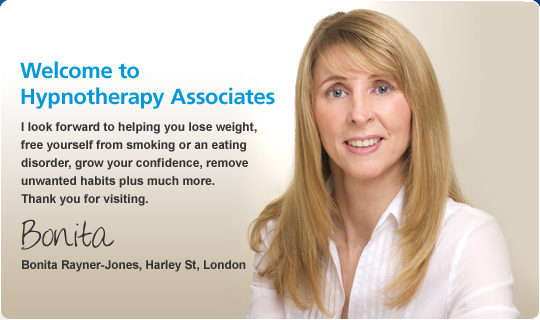 Bonita and her Associate Hypnotherapists in London provide hypnotherapy for weight loss, hypnotherapy to stop smoking, hypnotherapy for phobias along with hypnotherapy for confidence plus much more. Bonita is also an Advanced Transformational Coach if longer term coaching is something you would benefit from. If you require a Hypnotherapist in London, we offer appointments until late into the evening weekdays and Saturdays by both Bonita and her wonderful, highly qualified Associate Hypnotherapists at the Harley Street practice. Whatever you need help with, our hypnotherapy practice in London is looking forward to welcoming you to the clinic. Don't put off any longer living happier and enjoying more a sense of well-being in your life, we are ready to help. Through the latest advances available within Hypnotherapy, NLP and coaching today, our clients are enabled to ‘take the lead’ in their lives, being able to overcome fears, anxieties and doubts which have been holding them back. For example, we offer hypnotherapy for fears including fear of public speaking hypnotherapy, fear of flying hypnotherapy, anxiety hypnotherapy, along with weight loss hypnotherapy and stop smoking hypnotherapy plus much more. Fears can stop us letting go of a detrimental habits even though we know the habit is bad for us. Through our hypnotherapy, NLP and coaching in London, our clients have been able to free themselves from fears connected to detrimental habits and gain confidence to build a better, more fulfilled future in any area of their lives be it personally at work or both! As well as hypnotherapy to help our clients with weight loss and stop smoking etc. we also provide career coaching, business coaching and life coaching for longer term work. Hypnotherapy also helps with fertility and childbirth. You may wander why hypnotherapy helps so many problems? Our emotions are intrinsically connected to virtually every area of our lives, so when our emotions and inner confidence are balanced, the outcome is profound, where many barriers to enjoying life and letting go of old habits break down, and life becomes free, open and pleasurable. 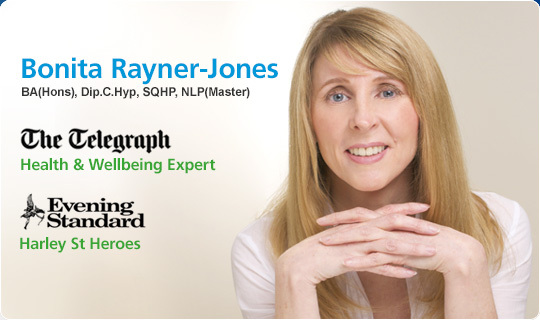 The Hypnotherapist behind Hypnotherapy Associates is Bonita Rayner-Jones who is a Senior Qualified Hypnotherapists, Master NLP Practitioner and Advanced Transfomraitonal Coach, along with a Masters in Occupational Psychology. Bonita is also a Senior Member of the General Hypnotherapy Standards Council. Bonita also employs a team of wonderful Hypnotherapists in London. Bonita is also the Telegraph's Health & Wellbeing Specialist and regularly writes for the Telegraph advising on health matters. Bonita also appeared recently in the Daily Mail providing hypnosis for IBS wih an excellent outcome. Her practice in Harley St has been featured as one of the ‘London Evening Standards’ ‘Harley Street Heroes’. (For further articles please see our press page). We’re glad you found us and we look forward to hearing from you.